Probably not. Commercially made fishing rods work well enough for 99% of the fishermen out there. But, if you are in that 1% of anglers who are truly passionate about the sport and want only the best quality and performance, a custom rod may be for you. 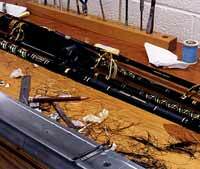 What makes a custom rod better than a factory rod? You may desire a certain diameter or shape of handle that is not available commercially. Or maybe your type of fishing requires something that you just can't get in a rod off a store rack. 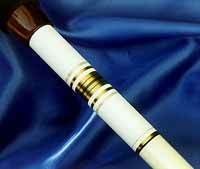 A skilled custom rod builder can accomodate almost any need or desire that a fisherman may have. What can a custom builder do that the factories don't? For starters, the custom builder will take into account the fact that all rod blanks have a preferred stress curve and orient it to provide you with optimum tracking on the cast, if that is your desire. Or he may set it up so that you have maximum response and power, if that is your primary consideration. These are things that commercial producers can't really take the time to do, nor are they building rods for the specific individual. 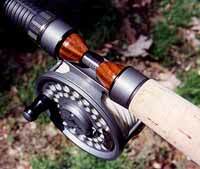 The custom rod builder is fitting the rod to you and your needs. It can be considered a highly specialized tool. Sounds good so far, but anything else? A good custom builder realizes that sensitivity is almost entirely a matter of stiffness to weight ratio. Thus, he or she will use the most modern and technology proven materials and techniques for mating the handle components to your blank. This provides you with a stonger yet lighter assembly and truely does increase sensitivity. Then we get into rod balance and the role it plays on the fatigue you feel after a long day's fishing. 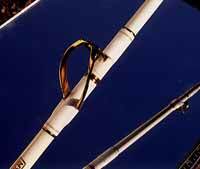 A good custom builder can do a lot to reduce strain and stress on the angler by properly balancing the rod. I thought custom rods were all about fancy wraps and decorations. Perhaps some are. But the true custom builder always places a premium on performance and precision and makes sure that form follows function. So I can't get fancy wrapping done on a custom rod? Oh yes, you surely can! And much more than that. 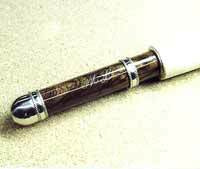 Much like a fine firearm with beautiful checkered wood stock and intricate engraving, a custom rod can be embellished with beautiful decorative wraps and distinctive handle and grip additions that make it uniquely your own. Many custom rod builders are true craftsmen who create rods that not only perform at the top level, but become genuine heirlooms to be passed down through generations. Are all custom rod builders equal in skill and ability? No, probably not. Just like people in any trade or craft, some are better than others and each may specialize in a particular facet of the craft. What you can be sure of, is that by talking with various ones you can certainly find the custom builder who can best meet your particular needs in a fine fishing rod. How much is a custom rod going to cost me? Probably more than your basic off the rack rod. 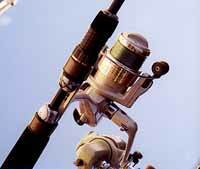 But many anglers feel that the higher level of performance and quality you get is worth spending a bit extra. 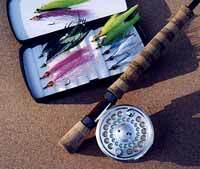 Custom rods are not for everybody, but if you are one of those who value a truly high level of performance and craftsmanship, a custom rod could well become one of your most trusted and prized possessions. Where would I start looking? You're already at the right place! 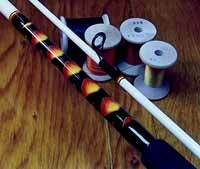 Right here on the TackleWorks directory you will find plenty of custom rod builders. Perhaps even a few right in your very area. Keep in mind that each one is an independent business person and you should contact them directly to discuss your needs in a fishing rod. Each has their own way of doing business and none is a reflection on any other. Talk to several and find the one that seems to best suit you and your particular needs.